The University of Wisconsin at Madison is picturesque, set on an isthmus between Lake Mendota and Lake Monona. With over 40,000 students from all over the world, this is a dynamic, vibrant place to spend four years studying, rooting for the football and basketball teams and watching countless sunsets on the Memorial Union Terrace. The campus is spread out alongside the lakeshore and offers miles of running, hiking and bike trails. Downtown Madison is only a mile away; bustling with tons of shops, restaurants, and bars. Transportation: Closest to campus, fly into Dane County Regional Airport (MSN), providing regional and national air service on Madison’s northeast side. Taxi’s and the city’s bus service are both available at the airport. Many students fly into Milwaukee’s Mitchell’s airport, one hour away, citing cheaper fares and more flight options. Take the Badger Bus, with daily service between Mitchell and campus. The nearest Amtrak stop is in Chicago, a 2-½ hour drive from Madison. School Traditions: Can a song shake a stadium? In between the third and fourth quarters of all Badger home football games at Camp Randall Stadium it sure can! When the song “Jump Around” by the House of Pain is played the entire student section, some fifteen thousand strong, jumps up and down in the bleachers, a sea of red and white. The sequence has become notorious and is definitely something unique to experience firsthand if you can during your visit. Stay: Right next to the University, on the shores of Lake Mendota, check-in to the Edgewater, fresh off a 100 million dollar renovation. Boasting scenic views of the Capitol and easy access to the University, Marriot’s new AC Hotel Madison Downtown has quickly become a top choice with visiting families. Relive your school days at The Graduate Hotel , a unique concept of collegiate-themed properties located in college towns that offer a stylish, affordable option with a local flavor. Another good choice is the Madison Concourse Hotel. Coffee: Coffee: Right on campus, Valentia Coffee uses all locally sourced ingredients. One student told us to be sure to try their homemade cinnamon rolls. Sencha Tea Bar on State Street is known for its signature tea lattes and blended drinks. For something local head to Madison’s first branch of Wisconsin’s own Colectivo, conveniently near the Capitol. Breakfast: Parents and students rave about the breakfast and Bloody Marys at Short Stack Eatery (open Wed-Sun) and Sunroom Cafe. Marigold Kitchen, voted the best breakfast by Madison Magazine, has an eclectic menu featuring chilaquiles, duck confit hash, tofu scrambles, alongside more traditional breakfast fare. For a delicious cheesy meal make sure to visit Mickies Dairy Bar, a 1950’s style diner located across from Camp Randall. The scramblers and fresh coffee cake are among their best items, but note Mickies is cash only. Basset Street Brunch Club also has an excellent breakfast menu with choices as varied as chicken and biscuits, oatmeal Crème Brulee, avocado toast, pancakes, and omelets. Are you visiting on the weekend? DLUX is very popular; we have to wonder if it’s just the food or the lure of the bottomless mimosas or the Bloody Mary bar. Lunch: Food trucks are not allowed in Madison, but the street food scene is hot and happening thanks to a ton of food carts. Many of the carts are located by Library Mall and downtown by the Capitol. Sample an international array such as Banzo for Middle Eastern, Bulgogi Korean Tacos, Caracas Empanadas, and Blowing Smoke BBQ. One Badger foodie said we must try the avocado spring rolls served from the cart Fresh Cool Drinks. These delicious, giant rolls are filled with vegetables, noodles, avocado and your choice of protein. It’s the perfect meal to take down to the terrace and eat by the lake in good weather. Would you rather sit down for a meal? Enjoy a great view of the capital while dining at Graze, inspired by N.Y.’s gastropubs. The market-driven menu offers a variety of small plates, soups, salads, and sandwiches. Offering Red Brat, White Brat and much more, head to State Street Brats for Brathaus favorites. Casual: Honoring all the great traditions of Wisconsin, eat at The Old Fashioned for beers, brats, and cheese. Everly is a sweet, intimate spot with food to match—make a meal out of the eclectic and creative small plates with everything from lemongrass shrimp toast to curry samosas to fried mozz gnocchi. Serving farm to table cuisine choose between Lucille’s, A Pig in a Fur Coat, Merchant, Graze, or Cooper’s Tavern. Students get their sushi fix at Red Sushi and Muramoto. A Step Up: James Beard award-winning Chef Tory Miller has created quite an empire in Madison. In addition to Graze, his restaurant Sujeo, a homage to his Asian roots, has been the talk of the town since it opened. L'Etoile serves upscale French-inspired American fare and his latest, Estrellon, focuses on Spanish inspired tapas in an impressive 6,000 square foot space with two dining levels. Alternatively dine at Fresco, on the rooftop of the Museum of Contemporary Art or sit lakeside at hip Bistro Sardine. Cento is where old world Italian intersects with a modern farm to table approach. Carnivores will be happy at Rare Steakhouse. New to the scene, enjoy panoramic views of Madison from the AC Hotel rooftop Eno Vino Wine Bar & Bistro Downtown. Late Night Snack: After a night out in Wisco, there’s nothing like the drunken ravioli or mac and cheese pies at Ian’s Pizza. Equally popular, Pizza di Roma, fondly known as PDR, is where students soak up a big night with a spinach and feta slice. If you’re looking for a full meal Tornado Steakhouse has a late night menu that serves food from 10pm-1am. Local Attractions: Madison has numerous museums to keep you busy after your tour. On campus, visit the Chazen Museum of Art, home to the second-largest collection of art in Wisconsin. It’s easy to spot the Madison Museum of Contemporary Art (MMoCA), you can’t miss the striking glass façade, located just west of the Capitol on State Street. Other noteworthy intuitions include the Wisconsin Historical Museum, the Geology Museum, and the quirky National Mustard Museum, a short 15-minute drive, located in the suburb of Middleton. Free tours of the Capitol building are offered every day without a reservation. Nothing beats Memorial Union Terrace for sunset where students gather with pitchers of beer, cheese curds or homemade ice cream. On Saturday, Dane County Farmer’s Market is the place to be. If you’re timing is right catch a Football or Basketball Game, The Badgers are consistently top contenders in the NCAA tournament. Just toured the University of Wisconsin, Madison Campus? 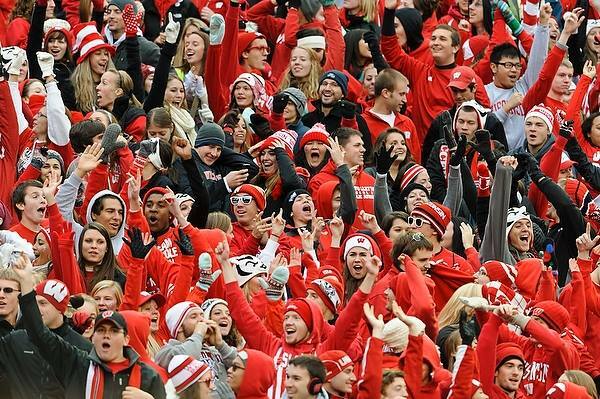 Are you a Wisco student, parent or Alumni? Fill out this 2 minute survey to supplement our Daytripper University Guide for University of Wisconsin, Madison!